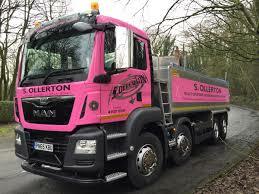 S Ollerton of Chorley has added a pink truck to its fleet this year in support of cancer charities. They plan to donate money to a range of causes based on how many tonnes of sand and gravel they sell. In February the pink truck raised £500 and Matthews and Leigh are delighted to be fund-matching the money that Ollertons have raised. The donations will be split between three very worthy causes – Myeloma UK, Cancer Research and The Chemotherapy Unit at Royal Blackburn Hospital.